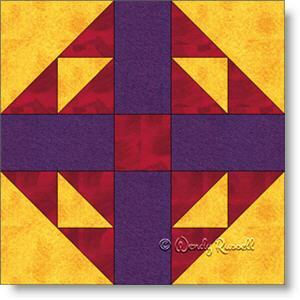 The Minnesota Cross quilt block is an easy block featuring only basic patches -- squares, rectangles and half square triangles. This quilt block is technically a five patch (as it is designed on a 5 x 5 grid), but it is sewn as an uneven nine patch. The colours in this block were chosen as they are representative of those of Minnesota State University. The two sample quilts are both designed on point with very different outcomes. I chose to reverse two of the colours in several of the blocks for the quilt shown on the right to see a new effect.